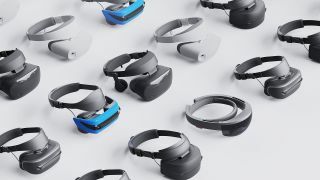 Microsoft has just added the OpenXR standard to its Windows Mixed Reality devices, which aims to make it easier to port virtual reality apps and games between platforms. Virtual reality has a lot of potential, but the number of different platforms and hardware makes things complicated – especially with certain games being exclusive to different devices. For example, Robo Recall is only available on the Oculus Rift. If you’re a HTC Vive owner, then there’s no official way to play that game – though there are a few fiddly workarounds. While OpenXR won’t stop platforms from having exclusive games, it does mean that if an exclusive game moved to another platform, the process would be much easier. It could also potentially make it possible to use different headsets with different platforms, for example using the PlayStation VR headset on a PC. OpenXR is an open and royalty-free platform standard that includes an API (application programming interface) that allows developers to create their apps so that they run on applications such as SteamVR and Google Daydream, and a device layer which allows virtual reality devices to display and interact with the application. By using those two layers, developers can potentially allow their app or game to run on a number of platforms and VR devices, without having to write the app for each individual platform. OpenXR has been created by the Khronos group, which is made up of some big names in VR, including Microsoft, Sony and Google – though Apple is one of the noticeable absences. With Microsoft bringing OpenXR to Windows Mixed Reality, it makes it an even more flexible platform. Giving customers more choice on what platforms and hardware they can use will hopefully benefit virtual reality, and make it easier for people to get into VR. Developers can download and install the OpenXR runtime from Microsoft’s website.